Crochet baby hats are SO much fun to make. 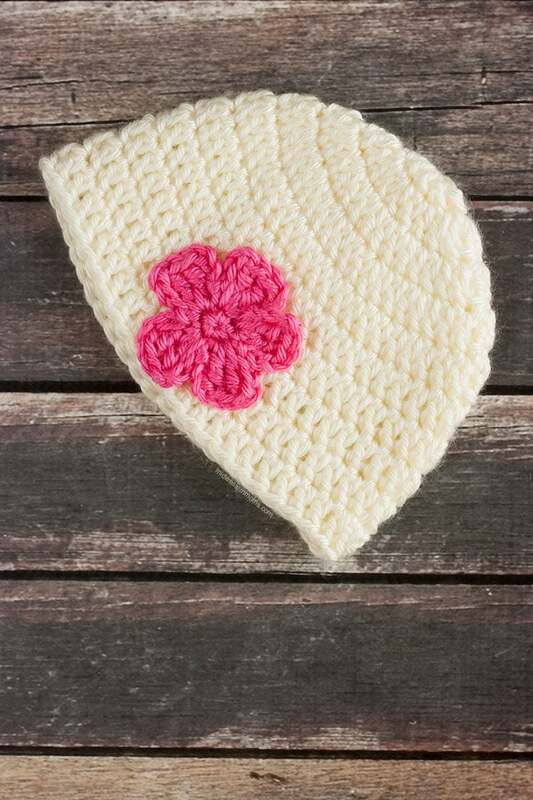 This is a simple crochet baby hat pattern with a flower and is perfect for a beginner. I wish I knew how to crochet when the boys were little, I could have made them some cute baby hats. Maybe I will have to make them some fun ones to wear this winter. I have never made a hat before so I thought I would start simple and small with this newborn crochet hat. Someone I know is having a little one soon but she doesn’t know if the baby is a boy or girl. So I decided to whip up a crochet baby hat for a girl. I absolutely love the little flower in this pattern. It really is my favorite flower to make. So simple and pretty. I have used it on a headband pattern and a bookmark pattern. I used Caron Simple Soft yarn for the baby hat pattern. It is nice and soft, perfect for little one’s heads. Yarn for your hat – I used Cream. Different color yarn for you flower – I used Pink. Round 1: Starting with the Magic Circle, Double Crochet 12 stitches. Join at the top of the first stitch. Pull the magic circle closed. Round 2: Chain 2. Double Crochet 2 stitches into each stitch around (24 stitches). Join at the top of the first stitch. Round 3: Chain 2. *Double Crochet 2 stitches into the first stitch. Then 1 double crochet into the next. * Repeat from * to * for a total of 36 stitches. Join at the top of the first stitch. Round 4: Chain 2. *Double crochet 2 stitches into the first stitch. Then 1 double crochet into each of the next 2 stitches. * Repeat from * to * for a total of 48 stitches. Join at the top of the first stitch. Start with the magic circle. Single Crochet 4 stitches into the circle. Slip Stitch into the first single crochet to join. *Chain 4, Triple Crochet 2 stitches, Chain 4, Slip Stitch* into the same stitch. Repeat from * to * for the remaining 4 petals. Cut your yarn and tie off. (Leave long ends to use or sewing the flower onto the hat. 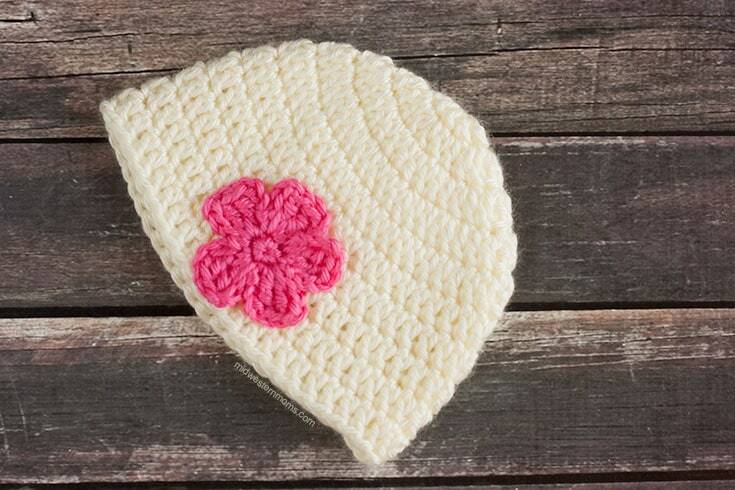 Using your yarn needle, use the ends left on the flower to sew it into place on the hat. Enter your information in the form below and an email will be sent to you with instructions on how to download your printable chart. Your new site look is awesome! So pretty! What size is this hat pattern? I need more instruction on the flower part of this pattern. Can’t seem to get it right. 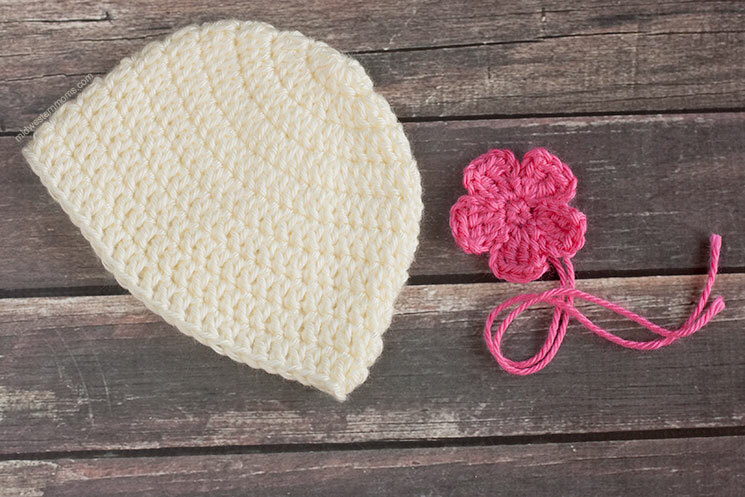 Simple crochet baby hat pattern for flower. What are you needing help with exactly? What is the magic circle? Do I need to do that or can I just chain and join the chain? You can just chain and join if you want. Here is a tutorial on the magic circle. Looks lovely and I like seeing patterns for beginners. I will be visiting again soon for sure! I love this pattern. Thank you so much for sharing. I will post a picture !! Know where to find you now! I love this pattern. Thank you so much for sharing your talent. Going to make this for my church Music Director. Will post when I finish it. Thank you again ! This pattern looks lovely. How would you enlarge it for a 6-9 month size please? Hello! If you use the measurement chart, you can follow along and make it to the measurements on the chart.